Hey y’all, Happy Friday!! Oh, and happy end of March already. You know what tomorrow is right? We’ll I’m not fooling but I’m planning to have a blog post again tomorrow. 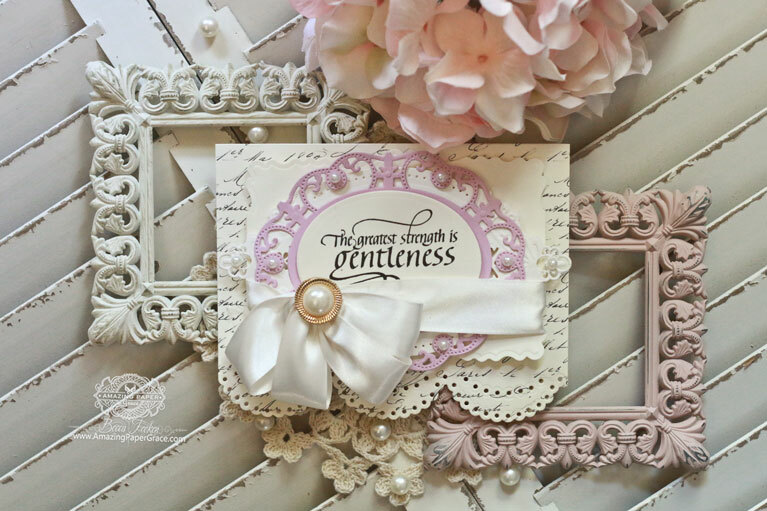 In the mean time, today’s card features a sweet sentiment from Quietfire Design – The Greatest Strength. So often I select a sentiment because it resonates with me, in something that has happened over the week. This week – for no reason – I rolled over to frustration. When I pulled this stamp out, it reminded me that the race is long and is not often won by might by but by patience and gentleness in the long haul. This is so hard to remember when you are trying to get somewhere fast but several small achievements and blessings were so helpful in correcting my course. Today I built my card on a printed cream card base 6.5″ wide by 5″ tall that I cut (both layers at once) a bottom border onto using Spellbinders Graceful Scallops. I love how that turned out and I played around with stitching floss through the holes. I didn’t keep the stitching for this card, but it will win its way onto the next card I make using Graceful Scallops. The focal layer is built in three tiers with Spellbinders Labels 29 on the bottom (adhered with double foam tape), followed by Spellbinders Victorian Bow. Directly on top of that I stacked Spellbinders Label 55 Decorative Element and finished with Spellbinders Classic Ovals SM (adhered with a single layer of foam tape). For new readers, every Friday it’s my pleasure to give away a card. The card goes to a randomly picked reader (worldwide) who leaves a comment in our conversation. Want to know more about Day of Giving, here’s a link to my FAQ’s just check out #11. You can check the list of winners HERE! For your comment: What do you consider to be your greatest strength? Hey friends, thanks as always for stopping by!! We are all tried and tested, and it’s only human to snap once and again. I don’t know that I have any great strength, I muddle along and do my best for my family and friends. 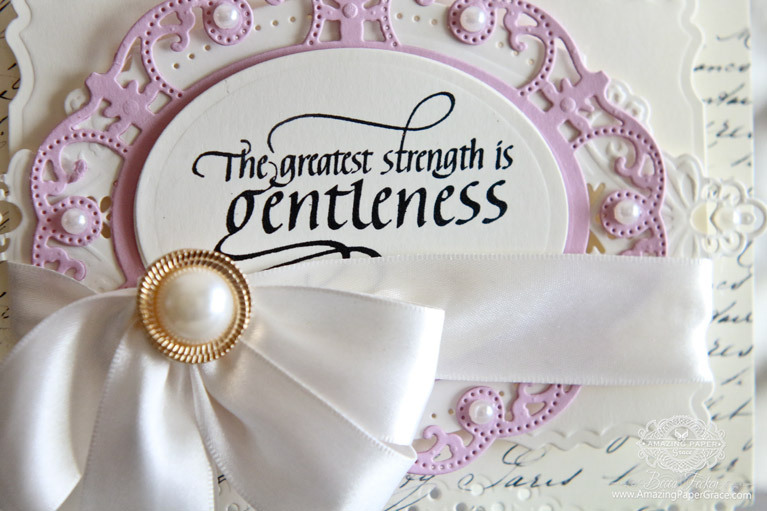 Gentleness is a great strength and a good reminder in how to deal with people. Thank you for putting it on a beautiful card. I think my greatest strength is compassion. Comes from many years of nursing in a variety of situations. I remind myself it could be me having such a trial. Love the details and layer ‘s on your beautiful card today, Becca! 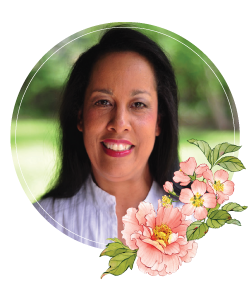 I continue to enjoy and be inspired by your lovely creations using your border collection. Add in pink and I’m definitely all in on this card! What a beautiful card today and I love the inspiration you’ve given us with border die. Pretty card today, Ms. Becca. Love the sentiment as well. I think my greatest strength is persistence. Just have to remember it can be a problem as well – there are times when one really should give in and let go. Hope your weekend is lovely and I look forward to tomorrow’s blog post! No foolin’! Indeed, your posts make my Fridays special! What a sweet card. As a newbie to the wonderful world of die cutting, I especially appreciate your extraordinary eye in finding harmony and balance in combining all these elements. You’re such a master teacher! Beautiful card as always Becca, my greatest strength is perseverance and loyalty . Another beautiful card Becca – love your colours, they work beautifully together. My greatest strength is the Lord – without Him I am nothing!! My greatest Strength is my ability to easily understand why someone has hurt me and being so very quick to forgive them. That and being so organized. This card is such a lovely reminder to reign in hurtful words said in a moment of frustration as the results of the words can never be taken back again and the scars can last a lifetime and because of the wounds festering, it often ruins other relationships you have or will have. Hi Becca very pretty card , beautiful sentiment gorgeous colours. Good morning Becca, fab card fab design!!! So sweet!!! My greatest strength I think is just being there for someone!!! This is another beautiful card. I think I need to write it on a paper & hang it in my room. I am cheerful & easy to get along with. lOVE YOUR CARD TODAY, BECCA! BUT DON’T I ALWAYS SAY THAT? LOVE ALL YOUR WORK! Beautiful card, Becca! I love the look of the scalloped border on the background paper instead of a separate border attached in white or a different color. I’ll have to remember this idea! WOW Becca, what a beautiful card!!! I really don’t know how to answer your question – what is my greatest strength??? Being alone now for 5 months since Jim winged his way to Heaven has opened my eyes to how my friends have been strong for me with all kinds of helps. It will take me a while to discover my strength or strengths as the case may be. Right now it is one day at a time and leaning on the Lord to direct my steps. Ask me that question a year from now and I might be able to answer. Currently everyone keeps saying I am very organized so that will have to be my answer for now – LOL! What a pretty card, Becca. Love the layers, the texture, the colors…I guess I just love everything about this one! Hi Becca, A very pretty and cute card. Patience is a virtue that I wish I ‘had’, but I try my hardest to be ‘kind’ and ‘giving’. Stunning card, love the colour and the beautiful dies you have used, that stamp really says it all. Just beautiful. You so often just hit the right spot, Becca – and your card is lovely! 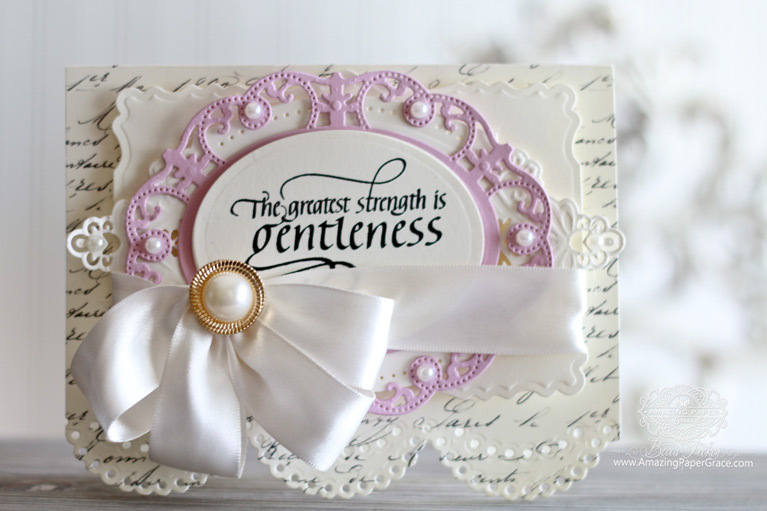 We certainly need more gentleness in this troubled world. My greatest strength comes from my Christian faith – I have to try to remember that daily!